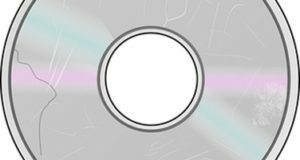 We want our tools to last as long as possible and when we know how to take care of tools they will last for years. Sure, use will cause tools to need replacement over time. I’ve used my round digging shovel for years and kept all mud and debris off it before storing. After about 20-years of use, the steel shovel head started to wear thin and wouldn’t do digging anymore with its oak or beech wood handle becoming wobbly from wear on the rivets attaching the handle. The head started to get nicks and after years of sharpening and smoothing those chips and grooves, I and that shovel just got tired of digging. Today, a hardwood handle is expensive to buy, and many handles are now made of fiberglass. They are priced from $20 up to $60. 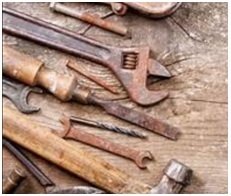 Maintenance is important to do for hand tools, power tools, garden tools, craft tools and even your kitchen knives. Store them properly where they are not just thrown in a box to bump around on one another and they will stay in good shape. Appropriate storing will save you time and money. This is one of my favorite ways to store some of my tools in my garage, including extension cords and rope. The second-best way for some items is a small tool box and I even use an old fishing tackle box for storing drill bits and Allen wrenches. If you are a professional mechanic with lots of tools, you might even like using a roll-around tool chest. Most of my hand power tools are stored in their original box on shelves with the User’s Manual inside always easy to find. 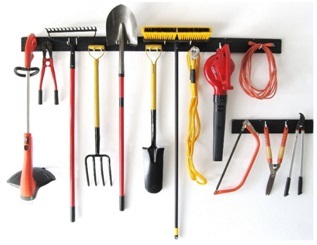 Pegboards are also available specifically for your handled items such as digging shovels, spades, hoes, rakes, snow shovels, pitch forks if you do your own haying, weed eaters, and more. You can add more metal pegs as you need. 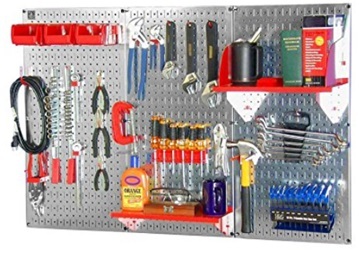 With pegboards you can see and find the tool you need at a glance rather than having them sitting on the floor falling over and tangling up with cords and other things to frustrate you. When tools sit on a concrete floor they absorb moisture from the concrete that sits on the ground. When you do not have a lot of wall space, pegboards are available with a hinged system or you can build it yourself. Portable rolling pegboards are ideal for small spaces such as a dedicated tool shed, small basement or a smaller garage. Tool boxes are an asset for storage. Some smaller ones are portable to take with you for those most often used tools on your construction, plumbing, or electrical jobs, or simply having handy at home. The rolling tool box is useful to organize small tools in drawers. A tool belt is a must when working. 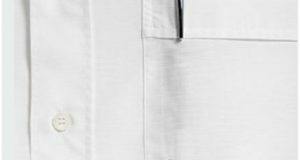 They are made for electricians and other jobs and come with suspenders and a holster for a drill. Rust will damage metal for good with enough time and use. Store your tools in a dry place, even in humid climates. That’s why it’s best to store your tools in a toolbox, drawers, cupboards, or hang on a pegboard. If you store your tools in a damp basement, try running a dehumidifier at all times. Small ones are not expensive to operate. A 200-square foot unit will only cost about $50. Dust invites moisture so add silica gel packets, a gel canister, or a vapor corrosion inhibitor if you see rust starting. If rust has a toe hold on your priceless tools, try spraying withWD-40® spray penetrating lubricant and scrub with a metal brush or use 3M Scotch-Brite® pads. Don’t use sandpaper because it scratches. After scrubbing, wipe off the tool with a cotton rag and put it away in its place. If you have heavy rust, use a rust inhibitor that is acid-based following the instructions on the container. After I’ve been digging holes for trees and tomato plants for hours I don’t really feel like cleaning the shovels, pruners, and other tools. It doesn’t take much time and it must be done. 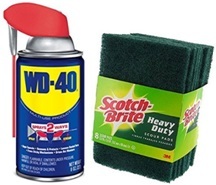 I use a spray of WD-40® for wiping off my pruner blades and put them away. You never want sticky gummy resin and moisture to stay on the blades to rust them. A good set of pruning shears is very expensive. 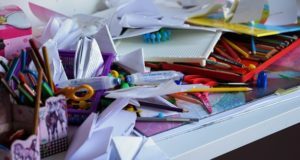 The few minutes doing this task will save you money for a new tool from neglect and time trying to find the tool you had and probably not available today if it’s an oldie but goodie. I have a Corona bypass pruning shear in good shape and with no rust about 15-years old. I wanted another one for a spare but it’s no longer available. Hardwood handles can be wiped down with a damp cloth—not a spray from the hose—dried with a cotton rag, not paper towels, and then rubbed well with boiled linseed oil. 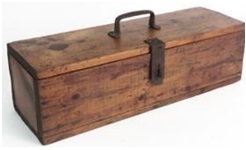 The oil will protect the wood and linseed has been used for years by the best carpenters and those-in-the-know. Garden and Hand Tools—can be easily cleaned by washing with soap and water—yes, detergent and water, rinse, towel dry then use a little WD-40® to lubricate and have the light film stay on to deter any rust. Do not use the heavy viscosity oil that you use in your car engine or lawn mower! With wood handles, use linseed oil, and if the handles are plastic, no worries—just remove dirt with water and dry. You can do this with your small hand garden rakes, trowels, fork root digger, and hoes. I do not like the plastic ones because they are not strong and break; therefore, I still buy metal or stainless-steel hand tools with wood handles covered with a spongy type material to save my hands from blisters. The rubberized handles are good too for saving your hands having a good grip. Power Tools—are a bit more difficult to clean. Pay attention to those spots requiring detail and always remove drill bits from drills wiping off all wood dust or other dust from the item you just drilled into. Be sure to unplug electric cords from the wall. With a cordless power drill, now is the best time to remove its battery and charge it up. You can use canned air that I use for my keyboard to remove dust or if it’s a larger tool you are cleaning and have an air compressor, use it. Be sure to lubricate all moving parts with machine oil. Always check your User’s Manual for how to clean your specific tool. 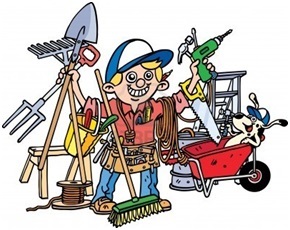 Now might be the time to give your tool boxes, carrying bags, and tool belts some love and care. I always remove all tools and wipe down metal with soapy detergent water, rinse, and towel dry. Wooden boxes just need to be vacuumed and a light coat of linseed oil rubbed on to keep the wood from drying out and it adds beauty. If you use leather bags or belts, use a leather polish, and rub in. If your belts and bags are made of other materials, check your User’s Manual to see how to clean. Usually spot cleaning will do. At the end of the day when your jobs are complete, and your tools are clean in their storage spot, you will feel better knowing that your tools will be useable the next time you need them not rusting away and wood handles deteriorating. How to take care of your tools is not rocket science and, yes, we don’t particularly like to do it. But with all good habits, we are rewarded over time with good tools, great values, and love for what we do.